Therasoft Online Reviews Recently Reviewed! The absolute best Mental Health EHR on the market! Pros: I have been using Therasoft Online for the past 8 years. I am long overdue in giving them my two thumbs up. I can not begin to express how pleased I am with this software. Therasoft Online offers a big product to the small private practitioner. It is a high-end software at an affordable price. Therasoft Online is comprehensive in terms the numerous features that it offers (i.e., registering, scheduling, assessing, documenting, storing, billing, reporting, sending auto-reminders, integrating social media/web marketing, and incorporating HIPPA compliant email, apps, and teletherapy, to name a few). Therasoft Online keeps my practice current and enables me to offer my clients state-of-the art technology to enhance their experience. I think one of the things that I love the most about Therasoft Online is the fact that my practice has been able to change and grow over the years...and I've never needed to change my EHR system. I started as a sole practitioner in Texas, expanded my practice to the US Virgin Islands, and grew into a group practice. Therasoft Online made all of my transitions seamless. From support team, I have always received excellent and competent service. It actually feels as if we are part of the same team. I have recommended Therasoft Online to ALL of my colleagues...it's the least I can do for a company that has been more than good to me. They have my highest recommendation. Cons: I really love the apps, but would like more functionality and integration. I am unable to see my client's secure messages and I can not see appointments confirmed by the client. Overall: Overall, I just love Therasoft Online. They have streamlined, organized, and enabled me to complete and monitor clinical and administrative tasks with efficiency and ease. This has allowed me to focus and spend more time on what I love and do best....provide therapy to some really awesome people. Pros: 1. Customer service is patient, straight forward, individualized and makes a consistent effort to be responsive. 2. Over the past year, Therasoft has made changes to their staffing system to increase availability after hours - which is especially important to me as there is a significant time difference between our respective locations. 3. There is no pressure to add more services than you need. They genuinely want customers to have the best fit which is, of course, a great customer service strategy but with Therasoft it's not just for show. 4. They have been open to scheduling regular weekly phone consults with me for as much or as little time as I need. If our rep - whom I consult with - is not able to make it, she notifies me ahead of time. Our consults are goal directed but have a personal warmth that I value and have come to trust. 5. THERE IS NO AUTOMATED VOICEMAIL SYSTEM with irrelevant mandatory options but not the ones you need and no way to access a human being. Usually I reach someone directly and that availability has now increased. If the answering service picks up, it can be a little frustrating - even when I've been frustrated and called repeatedly, Therasoft staff have been professional and focused on problem-solving. Cons: Occasionally, there are technological problems that can only be resolved by the developers. In fairness, these tech problems have been minor (not major - no lost notes, files, whole narratives). One of these problems was resolved only after about 6 months. I was persistent about it and appreciated that my persistence was treated in a matter of fact manner rather than an irritant. Admittedly, I wondered if they were really working on it. But then, one day, it was resolved - no fanfare, just fixed. Overall: I am the sole practitioner in my private practice and use Therasoft for storing client data, electronic billing, tracking and billing for co-pays, text or email reminders to clients about appointments, and encrypted emails for confidential information. Therasoft works FOR me - because Therasoft works WITH me! Thank you for your feedback, we appreciate you taking the time to Review our Company. I am sorry you had some difficulties with your documentation. We have made some changes for autosave so if there is any internet connection or other problems our system will autosave what you have completed up to that point. Glad you are able to make the software work for all your needs to do the job you love. Pros: Therasoft takes advantage of web-based technology and the "cloud" environment in three major ways: First, the system seamlessly integrates appointments and calendar functions, billing functions (electronic billing, electronic EOBs), credit card, and EMR chart components. Second, the Therasoft system integrates the familiar features of, and interfaces with, popular information management systems like Google Apps, as well as the convenient features of many PDAs. Third, Therasoft builds in the modular flexibility which is needed for the diverse user settings; users can modify intake forms and procedures, upload their own data (including faxes and other images), and post their own custom forms to patient charts. Users can also generate a variety of database reports. Therasoft also integrates with manual billing and electronic billing processing services,and patient eligibility and benefits certification services. Cons: The biggest con of the Therasoft system is that it is on the cutting edge of web-based systems and is, consequently rough around a few edges. Whereas all the components operate as advertised, there are idiosyncrasies within functions that one wishes were more smoothly operational. For example, Therasoft provides an innovative display method for the main calendar that allows users to see, at a glance, the status of every appointment and allows single click updates of attendance, billing, and insurance functions. However, changing appointment characteristics (for example repeat appointment changes) can involve an unnecessarily complex series of steps. Similarly, the vast array of operations and data displays available for patients can be overwhelming for first time users. Fortunately, Therasoft provides free hands-on training for new users. Overall: Therasoft offers a sophisticated integration of all the main functions of a busy psychotherapy practice and is scalable to the size of the practice. The software itself incorporates easy user access to functions, customization of documents and the ability to upload your own documents. It is state-of-the-art in terms of web usage, HIPAA security & backup, and integration with external software and human billing systems. They provide a good cost-benefit ratio, especially since one does not have to download or maintain software on one's own computer. The current version is in its final development stages which provides a few rough edges but is full functionality. Fortunately the strength of the design and implementation so far suggest that a smoothly running, user-friendly system is just around the corner. Pros: It is very focused towards the private therapist who deals a little or not at all with insurance. It is very easy to schedule an appointment and bill to insurance. They also work with you to help get the EOB's integrated and EFT set up so receiving payments is super easy too. The drop down menus are easy to navigate and pretty straight forward. They also give you some reports that are helpful to maintain a healthy business and provide training videos on some functions that aren't intuitive. Cons: From a legal and financial standpoint, things could be improved. The software is very focused on documentation the clinical side of things but not the financial. There is currently no way to record credit card payments if you don't use their system other then the "other" selection. It does not record changes made in the system to the patients payment accounts (ie insurance paid but then took back the money, you delete all record of payment and have to keep a paper copy to remember what happened). While you can make a note on a specific date of service, there is no place to record a financial based note that effects the whole account (ie patient called to complain about whole bill, here is what we did). It would be nice if the system moved something from insurance to patient responsibility only after you record a payment from the insurance, but they system does it whenever so you have to review all invoices to make sure they are truly for the patient to pay. It would be nice if they improved the ease of: viewing patient balance, pull report for what is pending to insurance, re-bill claims to insurance and/or a new insurance, provide tracking in the system so instead of deleting things, you would "back it out", and provided a place to scan outside records so we don't have to keep paper charts with the electronic ones. Therasoft is a personal assistant for the disorganized therapist! Pros: The program is comprehensive-from start to finish. Registering the client is very easy and the forms automatically put information in the system where I need it. The billing is very easy and really is one just one click! The treatment plan section does help simplify and organize my work with clients. The system is very smart and easy to use once you learn all the details and all it has to offer. I'm still discovering new features all the time that helps to make my life easier. INNOVATIVE is the main word to describe this system. Cons: The calendar squares are too small. I wish that I could click on a client's name and then be in their individual system with a VERTICAL list of their personal info, assessment, tx plan, medication,progress notes, discharge summary, and payments. This would be an easier set up as I often get confused having to click all aroundclient lists when working on one client's information. Therasoft definately needs a medication section with history, dosage, side effects-it would be great if the current med list AUTOMATICALLY populated each progress note and that it could be amended right there instead of having to rewrite the meds each time. I wish that I could view a ROLLING screen of the progress notes instead of having to click between screens from different dates of treatment. Therasoft desperately needs a Help tab to answer quick questions about using certain features. Despite these limitations, I bet these features will be added VERY soon given the responsiveness of the company. Overall: Overall the program offers the therapist a way to organize his/her work. It helps me to dot my i's and cross my t's so that in the event of an audit I know that I have collected all of the required information. The support staff have been very responsive and willing to take the time to answer questions. Therasoft is a company that is willing to implement the suggestions given by its clients and that it is working to continuously improve their product to provide the best practice management system available.Overall, the Therasoft saves me time and provides with peace of mind that I have all the information I need to have a complete client medical record. I have recommended this program to others and think that as long as the monthly cost stays equal to what I get paid by the insurance for one session then I will continue to be a faithful follower. Therasoft EASILY & COMFORTABLY meets ALL OF MY NEEDS as a solo practitioner. Major Kudos! Pros: I love how help is so available from the support staff. Not only are they knowledgeable but for less tech-savvy individuals like me, they are patient and provide guidance in a manner that helps build my confidence in going forward. The program is very user-friendly and intuitive. Therasoft has also done an excellent job in providing ( as well as anticipating ) all of the ingredients necessary to run a successful a practice; it is right at your fingertips. The scheduling of appointments, billing, therapy notes, CPT codes, DSM 5 diagnoses, as well as an app for your phone that can provide your entire client list, contact numbers, and daily appointments. They are even introducing video therapy sessions/conferencing and electronic billing (for an additional yearly charge scaled to the size of your practice). In brief, I am totally satisfied and would DEFINITELY encourage any practitioner to try their free 30 day trial......you will NOT be disappointed :-)!!! Cons: Perhaps, in the future, Therasoft might consider developing a platform to dictate notes and appointments instead of my having to type them (for the computer as well as for the app)......just a thought. Overall: It has helped me to be better organized and thus feel less stressed. Having everything now available in my telephone app is the icing on top of the Therasoft cake. The creator of this program and his/her hand picked staff deserve my heartfelt thanks!!!! Thank you so much for the kind review we sure appreciate it. I wanted to let you know we do have this option to dictate. Give me a call 888-435-8203, and I can teach you how to-do this. You will need to download dragon dictate and also have you checked out our app? it's called Thersoft download this in your app store on your phone and you can dictate on their as well. Again thank you for the review. We are very excited to be a part of your practice and help you be successful. Comments: It's difficult to think of a more comprehensive software available for therapists to run a private practice, in terms of variability of options for charting, assessments, and treatment plans. It also excels in terms of its intuitive interface from the calendar, which makes it very easy for new therapists to learn. We've been using Therasoft for over three and a half years and, on the whole, have a limited number of complaints, but the complaints we do have are significant. The first problem area would be in terms of tracking aging claims. There is no clear and comprehensive way to manage aging claims in Therasoft. While there are multiple areas to manage claims from within Therasoft, there exists no simple way to manage bulk claims, aside from cobbling together effective methodology from the various reports that Therasoft generates in the form of excel spreadsheets. The second area that I would give Therasoft poor marks in would be in relationship to secondary insurances, as Therasoft offers no mechanism to track secondary insurance claims. While we've developed our own internal procedures for tracking these, it currently can't be done with Therasoft alone. In addition, Therasoft offers its own merchant account for credit card transactions. Unfortunately, Therasoft's merchant account services offer no itemized report for what you are being charged on a per transaction basis. The reports available within Therasoft often seem to disagree with one another and do not always match bank account deposits. While I have called and emailed about this, it has never been fully resolved and remains an ongoing problem. Which leads me to my final criticism. Responsiveness. While I have to give really high marks to Petra, Irina, and Gene over at Therasoft (they are super-helpful for day to day challenges that might arise), problems related to Therasoft's functionality are rarely addressed in a timely manner. Jas is the only person within Therasoft that seems to have the ability to edit, alter, or fix Therasoft when it comes to matters of core functionality, and his responsiveness has become increasingly limited. Therasoft offers a better array of exceptional components than most of the competition does, despite my above complaints, and I still believe they offer enough functionality to make their software my first choice, though I think it worth a prospective customer's time to investigate the needs of their practice before making a decision. Pros: The ease of understanding processes and flow, user-friendly navigation, the common sense layout, the unbelievably helpful customer service line and the video tools for troubleshooting. Cons: The billing portal. It would be most helpful if the software system allowed hyperlinks to be pasted into the messages sent on the electronic invoices to clients. Overall: Therasoft has made running electronic remittance (ERAs) a breeze between insurance providers. There is a fluidity that makes billing less stressful and easy to manage. Therasoft's layout provides the therapist total command over the note taking, billing and scheduling processes. The customer support works diligently and patiently by your side the first couple weeks until you really feel a sense of mastery with the system. Especially customer service rep has been a dedicated and reliable who has helped me iron out many kinks along the way of starting my business. I have never seen a more stellar customer service team than Therasofts. Never. They are consistent, knowledgable and welcoming assistance any time I've ever called. Their "walk you through" approach is what leads business owners feels competent with the software in no time. Thank you for the good feedback, we appreciate it! Also did you know that on the Client billing statement you are able to send an email out to the client with a pay now button? You are also able to send a hyperlink for the patient to be able to pay, call us and we will teach you how. We also have a client portal the client can log in and also pay on their account. I have used this system for over a year. I honestly don't have any complaints about this system. Pros: I like having everything bundled with one company. I like the convenience that this service provides having access to records on any device connected to the internet without having the records stored on that device. I think they go far beyond my expectations for any customer service with the time they took teaching me about the system all the way through. I can still contact my customer service rep today and she would be there to answer any of my questions. The system is easy to use and includes absolutely everything I need for my small private practice from website, records, I can store educational materials, They have added hippa compliant video services but I have not used them, I can even let them become my billing department and have yet to have any issues with insurance. Cons: I wasn't a fan of the mobile app, it just felt different to me but I can very easily open it up in a web browser on any device so not that big of a deal. Thanks for taking the time to review the software. Working with you has been great! Excellent, simple and intuitive software, and great people to work with. Comments: Simply put, since I made the decision to utilize Therasoft, my productivity has gone up by an average of 6-7 clients per week. Therasoft removes the frustration of dealing with insurance, posting payments, etc., and allows me to focus on marketing and on providing sound, quality care. They are excellent people to work with, and many have been or are in the helping field themselves, which help provide a strong degree of empathy with my work needs. The progress note templates and treatment plan templates are excellent, their website services are equally excellent, and the calendar and appointment reminder elements to the software are fantastic. My clients appreciate the reminders sent via text or email or both. For clients who choose to file super-bills themselves or have out of network requests, Therasoft makes that process simple as well. Literally, with the click of a button, you can send a super bill, send out billing statements, keep track of referral sources, etc. Essentially, there isn't a business need for billing, documentation, appointment setting/keeping/reminding that Therasoft has not been able to help me with. The transition from DSM IV to V was made far less stressful with Therasoft's reverse engineered tool to find ICD-10 codes according to DSM IV codes. The only con I've experienced is their server gets overloaded at times, so logging in or saving information can be delayed a bit, but a quick browser refresh tends to solve that issue. The other con is that I, like many of us when we first start out on our own, tried to cut cost and do all the billing myself. However, as I previously stated, with the extra clients I'm able to see as a result of Therasoft taking on the dirty work for me, the Enhanced Billing Services more than pay for themselves. They even audited my past work and found money I would not have known to look for. I cannot say enough about this company. The product is effective and easy to use, and the people who run it are kind, patient and will take the time necessary to ensure you feel comfortable. Please strongly consider utilizing Therasoft not only for their documentation and appointment calendar elements, but also their website design and enhanced billing elements. Thank you Michael for the great review! It is always a pleasure to work with you. Efficient use of data from registration, to notes to billing. Pros: Efficient use of record keeping. Easy accessibility with the phone app. I appreciate how you can add insurance instead of only having a record of one insurance. I appreciate how the Therasoft includes insurance feedback about amount paid and amount owed for each session. Cons: More efficiency. There are multiple clicks. So when I click regarding registration, I wait a while before I can click bill insurance. I wonder if any of the buttons can be grouped or quicker without delay? Its hard dealing with any lag time at the end of the day or between doing other tasks. I would also appreciate more efficiency when I call for help. Most often someone is not available and when I can a call back-its at a random time and the person does not address my question over voice mail, nor gives me a specific time that I can reach that person. So theres some frustration around accessibility for help. Once I reach someone, the service is great. I depend on Therasoft Online to run my practice. I have been using it for 8+ years. Pros: It does so many things from documenting the client's first contact to the initial assessment to the treatment plan and the progress notes. It allows me to send text message reminders which the client's love. I have not implemented the tele-mental health program yet but know it is there. I now have gone paper free and have all information scanned in to the documents and notes tabs. Cons: The main weakness has been with A/R (accounts receivable) but now they have a service for that area and I am trying it out. Overall: Ease of use for staff and clients. I have gone from a solo practice to a group practice using it. I am in process of having my group practice acquired by another company and hope they will continue to use it. I am glad that you are trying out the A/R program, I believe you will see amazing things. We have been using Therasoft since 2012, it works well for our practice. Pros: It has consistently improved over the years. This is important because the electronic environment has changed as well. With changes in electronics and in state laws, Therasoft has maintained the ability to change with the environment. Cons: Sometimes the system runs rather slow. I would blame my WiFi system, but this is a true statement for more than one WiFi system. But overall, it is an excellent program. Overall: It takes care of all the requirements to keep client notes for the state of Texas. It also handles a number of insurance companies and their required filing and payments. Thank you so much for the great review, give us a call and we can look at possibly why it is running slow for you. We always strive to make things run faster, maybe we can do some changes on our side to make things run smoother. Give us a call at 888-435-8203 and talk to a support staff we are always so excited to help someone out. Thank you for being such a loyal customer all these years! Comments: For most of my career, I have not had to deal with the nuts and bolts of a private therapy practice. I had either been employed by a group that provided all support services, or I contracted with a practice management service which did everything for me. All I had to do was my clinical work. But with the ever shrinking reimbursements from insurance companies, I was forced to cut overhead costs in order to make it in a private practice. That is where Therasoft Online has been a life saver! Therasoft Online is a comprehensive practice management service that allows me to do my own scheduling, billing, bookkeeping, digital therapy notes, practice analysis, report writing, referral source maintenance, client communication and more that I have yet to discover, all from my office computer, or from any computer with a secure internet connection. I am able to save from $450 to $700 each month by doing tasks that I used to pay for without Therasoft Online. Depending on my work load, which ranges from 30-42 clients each week, I spend 2 to 5 hours per week on my practice business,, most done from home on weekends or after hours. And I can get a lot done in those open hours between appointments! There is a lot to learn about practice management, and I was totally "green" to this aspect of my work. I have to say that I have proven to be a slow study in becoming familiar with the many aspects of "running this railroad". The Therasoft system was at first very confusing, complex and at times intimidating to me. Someone with a better starting familiarity with office procedures would likely have less difficulty than I did. But the support staff at Therasoft Online has been VERY responsive to my needs, and have been very patient with helping me learn the system. Therasoft pricing is what really sold me on the service. If I want it, I can opt in for more hands-on management of insurance claims and follow-ups, but at less expense than I had before. I recommend Therasoft Online to any Private Mental Health Practice, regardless of size. I am a sole provider, but the same services that I enjoy are available to group practices also. I love having every aspect of my practice in one place! Comments: I've used Therasoft Online for several years and I'm very happy overall. There are many pros, but I appreciate knowing my HIPPA compliance is covered. I love having insurance filing be so quick and easy. All billing payments, whether from insurance or credit cards, are automatically credited to the client's account. That is a huge time saver! I love the 1 page attendance, payment, insurance file, progress note. Perfect! In terms of customer service, Jas, Irina and Petra have been responsive and wonderful! Others seem to need more training to be able to answer questions. The credit card processing rates are fair, as are Therasoft's fees. There is cheaper software, but they don't seem to include as many features. I believe Therasoft covers everything. Overall, my only con is that it's often not aesthetically pleasing, but I feel that its getting somewhat better. Buttons/boxes/fonts/colors/flow of use are not very elegant or intuitive. There is a huge learning curve in using it! I'll be specific about other cons, in hopes that they can be easily changed. I'd like to find tutorial videos for all the features (i.e. how to set up groups/sessions-it's confusing). I'd like a photo to pop up of each type of report. They have similar names and I have to create many before I find the one layout I need. The reports could also be more aesthetically pleasing. Sessions can't be deleted without first deleting the payment then going to the attendance tab and deleting again. I'd like to see attendance be cancelled/deleted while the payment is maintained/moved to deposit. Sessions can't be deleted from the mobile app. There was a time when my insurance claims were being hung up in Emdeon and I had no knowledge of Emdeon or it's role - again a tutorial would be good. I lost money in this situation. Maybe if a claim gets hung up there, an alert would appear in Therasoft notifying that something needed to be addressed. I would like to be able to customize my website myself (like I could do with Intuit) Having access to a templet where I could post seasonal announcements, change photos, etc. would be great! Cons: Would like the assessments client codes to go directly to the clients and not have the therapist responsible for emailing the clients their codes. Overall: Therasoft Help Center is always on top of addressing tickets. Our rep is AMAZING!!!!! Wonderful support, extremely knowledgeable and very helpful. She has OUTSTANDING customer skills. She gets back to you immediately, her follow through is great. I always ask for her if I need assistance or have an issue arise. The reason Therasoft does not send out the code is because then it is not secure, if someone was to get into the email then they would have access to the information so this is why you have to give them the code separately. Did you know that you can have the client sign into the portal and fill it out as well? Call the support team (888)-435-8203 and they can walk you through this process as well. The portal allows them to do the assessment through a secure portal that is compliant for security. Our first EHR, like the clinical and billing capabilities, but some problems still not fixed. Comments: We like the combination of clinical and billing features, thus streamlining our processes. Problems with supervisor signatures lines appearing on fully licensed psychologist's Standard progress notes when printed have not been corrected in TWO YEARS in spite of promises, "The developers are working on it." For those of us using your back office enchanced billing, I would like to see reports (graph and text) showing the $ health of the clinical practice and collections: re total $ collections, ratio of $ and % of collections to $ and % of collectibles , $ and % of write-offs and adjustments, outstanding AR, average collected per CPT code. Also, current progress notes do not have a non-billable, non-attendance option for a note (e.g., content of phone conversation) that would appear chronologically with all the other progress notes. There should be that option. When we started up in July 2015, we were advised that it would be quite possible to combine our old AR with the new Therasoft AR, even though our old AR had to be manually entered for each established patient. This was a FIASCO and cost us thousands of dollars in lost AR and problems with maintaining the good will of our clients because of billing errors. We followed Jas' advice but he over-promised. Advise your clients to bring a balance forward from the old AR and leave it at that. We are just now recovering from that problem from four years ago! This problem also undermined our confidence in Therasoft's ability to deliver on promises. I would also like to learn more about Therasoft's reporting capabilities. Perhaps an advanced practice training for experienced users who can come together face to face and learn of the program's other capabilities when it comes to managing a practice, reviewing the financials, , streamlining reports, etc. Your enchanced billing collection fees are reasonable. We have decided to use this service because of the redundancy built into your staffing capabilities, Gene and staff working hard in getting our AR down and more current, and following up on problem accounts. Pros: All features. Mostly calendar, assessment forms and history. Keeps us on track and sends reminders to the clients. I dont use the client portal which seems impractical for me. colored icons are attractive and easy to use. They did my website and I am very pleased with it. Cons: Reports can improve. I like the reminders. Some more simplicity with client portal use. Customer service and staff need to introduce when necessary so we know who is incharge of the portfolios. Billing plus can be in house. Billing and other reports can be better. The secure payment offer is convenient but too costly and complicated. It can be cheaper as there are cheaper vendors. LIKE CAYAN . Which is a whole saler. Easy to use software with great customer support. Pros: I use the system daily for all my office management needs. The calendar system with email reminders for clients is one of my favorite features. The ease of submitting payment and completing a clinical note at time of service has streamlined my practice. Cons: Some of the reports for credit card charges and superbills are not as user friendly. For example, I wish I could send superbills to an alternative email address. Did you know that on the registration page that you can send the superbill to two different email address? All you need to do is on the registration page insert a comma in between two email address and then when you send the super bill from the reports tab you will get a popup that you can check which emails or send to both emails, if you have any questions or need further guidance please call our support team at 888-435-8203 and we can walk you through this. Pros: Being able to do everything to run my practice from appointments, documentation, marketing, and billing. I have tried several other software programs prior to Therasoft Online and had to piece mill other programs to make it all work. With Therasoft I don't have to use any other program to fulfill my needs. My clients like the ability to register and schedule their own appointments for convenience. I like the ability to have online sessions for clients that cannot travel to the office. The mobile app for clinicians is very user friendly and provides more features than other softwares I have used. Whenever I have a question or problem the team is readily available and responsive. Cons: The price is a little higher than other EHR software, however the features are worth it in the end. Overall: Being able to run and manage my practice more efficiently. Thank you so much for the review. We truly value your thoughts! - its the best software out there at this time. -love that it receives info back from insurance regarding payments. -The delay in response times to tickets in unacceptable. There have been times when there was no response. I wish there was no ticket system. counselors are on a crunch time schedule and to pay a lot of money and to not have the person who answers the call help you- is very irritating. -Its disappointing that the syncing device is very limited. Its mostly limited to calendar and payment. Theres no ability to delete an appt in order to make another one. -Its hard to record a canceled appt in the calendar and scheduled appt in the same slot. This makes it unclear for record keeping. So calendar needs to be able to hold to appts per slot. -Case note needs improving- to include auto set what type of note and to allow for some prefabricated sentences. Like appt scheduled in one week. -I need to search clients by first name as an option to last name. -Over all there needs to be a decrease to the number of clicks, but I love the "to do" info that displays on each appt in the calendar. -I wish there was an option to self-identify additional numbers, like- Husband, daughter, etc. Often I have children as a client and can only put in cell and home phone. This is not convenient, as theres no way to record who's cell number that is. _AZ requires that each form has a confidentiality statement: *** Confidential contains Privileged Communication protected under A.R.S. 32-3283 and ***Federal Confidentiality Rules (42 CFR Part 2 & 45 CFR Parts 160 & 164) Unauthorized disclosure is prohibited***So I recommend leaving a template notation area for forms. Therasoft keeps me in business. Pros: Therasoft has amazing customer support and is easy to use once you train with their tutorials. The phone app allows me to manage my client load once entered into the system. From intake to insurance claims, Therasoft handles all my needs and makes my life easier. I cannot imagine trying to run my business without it. Cons: Training takes some time but is very rewarding. The support is always there to answer questions and resolve issues. Overall: When I began with Therasoft, I was owed thousands of dollars in insurance claims and had no idea how to resolve it. I needed to 'go digital' in my systems and TS was there to walk me through the training and help me receive payment. Reps are life savers and keep me sane in my work. I am a loyal customer as a software system is only as good as the people that support it. It is worthy every penny! The support system is excellent. Pros: The ease of using it. It has everything. I need at my finger tips. I can look at a glance to see client status. That they attended session, they paid for session and notes on session completed. I can easily see outstanding balances on individual clients as well as over all summary of outstanding money owed. I do not take insurance so I can not comment on that part of the program however it looks straight forward as far as ease. Thank you for taking the time to review the software. We've enjoyed the journey with you for the last 7 years and hope to enjoy the NEXT 7 with you as well! Pros: The product is very user friendly. The price point is excellent. Customer service has always been extremely accommodating - knowledgeable, friendly, and go above-and-beyond what would be expected. Cons: Our only complaint has been the inability to add in customized forms such as in-take, treatment forms, etc. Thanks for taking the time to review the software, We have recently added a feature to allow the clients to complete and sign customized intake forms. I've just sent you an email regarding this. We value our users opinions and try to accommodate the needs of our users whenever possible, I hope you enjoy your day! Without this software and the people supporting it, my practice would suffer greatly. Pros: Ease of use, multifunctionality, and the support staff in the A/R department; without them, I would suffer financially, as my focus remains on my clients as opposed to my earnings. Without their efforts and consistent support, I would know little to nothing about what is needed in order to submit claims and deal with insurance companies. Cons: Given that I employ the calendar for both professional and personal use, I'd like to have the ability to more easily overlap sessions and personal events. Overall: My practice is efficient and I am able to handle all aspects of practice management. Pros: Therasoft is an easy program to learn and use. It meets the needs of my moderate sized group practice while remaining affordable. Customer support is top notch. We can contact them by telephone or email and any questions we have are answered quickly. Cons: There is a large selection of reports. At times, it can be a little confusing figuring out how to get the information I need. However, the costumer support team is always available to assist with this. They also provide a large number of webinars and training opportunities that would make the process easier (I have not had the opportunity to view these yet). Overall: I have had a great experience with Therasoft and highly recommend this program to any mental health practice! Therasoft works very well, lots of reports and easy to use. Pros: The scheduling is easy, good reports , over the years many new features have been added making it more useful. Cons: The only con I would state is being able to review past notes. There are a lot of clicks to go from note to note. Thank you for the great review, we always love to hear the good things and even the things that you are struggling with, this makes Therasoft a much better software because we are hear to listen to you and meet the needs we can. Call us on our support line and we could help you with the viewing of prior notes, maybe even make a change that makes things easier for you. Cons: too complicated, not user friendly. Treatment plans and assessments does not measure up to other practice management programs. Overall: complete and comprehensive application, not user friendly, reports are difficult and is not rendered in clear narrative much corrections are needed by user. Too much time spent entering info and correcting info into readable narrative. Recommendations to other buyers: Review other practice management programs and try to make therasoft more user friendly. I would switch programs but have stored more than 600 patients in therasoft. if the info/data can be sync with other practice management programs I would quit Therasoft. Pros: We especially like the ability to enter, store and retrieve documents and information on the electronic record. Cons: Can be a bit cumbersome setting up insurers, coordinating emdeon and insurer electronic filing and payment process. But once it is in place, it is great. Overall: We have recommended this product / service to many clinicians in our area. Thank you for the referrals and also the great review, we know at times there can be some roadblocks and that is why we are here to help you through those. We appreciate you as a customer and love the feedback makes us grow as a team and so does the software. Pros: Therasoft is easy to use. It not only has an easy to use progress note, but also tracks accounting aspects of your business. Therasoft also has billing that you can send statements to your clients each month. I also like that notes can repopulate from the week before. Cons: sometimes moving from screen to screen takes too long. Overall: Therasoft on line makes it easier to keep track of appointments, keep track of payments, and easy to send claims. Call us sometime and we can teach you a trick on the screen to screen moves! using Therasoft since April 2016. it is a very functional full practice management product. Pros: I love the availability and responsiveness of customer services. there are many templates for most any type of client interaction. this product is just perfect for a single provider or a growing practice. Overall: Therasoft helps me stay organized. I love one platform for documentation, billing, etc. Thank you for the great review, we understand the treatment plan has a lot of details and sometimes it can be overwhelming but we do have suggestions on the treatment plan to help you save time, if you need help with this please call our support team at 888-435-8203. Cons - it is not very user friendly. We have a very unique practice, so I understand that finding software for our particular needs is going to be tricky. I appreciate all that therasoft does to try and meet the needs of our practice. At our practice we run several group therapy sessions. Finding individuals in the groups is ridiculously difficult. We have to know the name and date of the group in order to find a particular individual. Ideally we should be able to find the client under the 'individual' tab, and there should be a list of appointment as well as group therapy schedule. We also have several clients that have their bills paid by a third party. Some of them like to share the cost. Therasoft is incapable of accurately splitting the bill. We have tried using the provided percentage option, and it does not calculate accurately. We would also like to be able to put money on deposit and have it held for that particular date. (For example, we have had clients pay for the full session before we know if insurance will cover the cost. It would be nice to be able to put that money on deposit, but have it held for only that session date (obviously, with the option to easily move it to another day).) When there is money just sitting in the deposit account it is difficult to know when it got placed there and why it is placed there. We also have had several customer complains in regards to the bill. It is difficult for them to read and understand. It is also difficult for us when they tear off the bottom portion and mail it into us, it does not give any dates that that bill is in regards to. It would also be nice to be able to edit a payment once it has been added. There have been several times when I enter in the payment information, only to discover after the fact that I put in the wrong date, or the wrong transaction number, then I have to delete the whole payment and start over. Overall, we use therasoft because it is the best software for our billing needs. However, I do feel like it is challenging to get around. We actually use a secondary software program for our therapists and clients to keep track of appointments because of the way it looks, its ease of use, and the ability for clients to book their own appointments online. Thank you for your detailed response, Jeni! Our client's input helps us grow and improve. I know that we have spoken about some of your concerns in the past and addressed some that you had. We do have some great improvements in the works. I think those will address more of the items you have mentioned. Let me know if you would like to schedule some time to meet to discuss things further. Billing, clinical documentation, marketing, scheduling.....Therasoft helps do it all successfully. Pros: The customer service is excellent. Every single person we have worked with has been amazing. They are professional, available and respond quickly every time. They have gone above and beyond in assisting us in successfully using the program to our benefit. Cons: The deposit account has caused some issues for us. Probably a user issue, not a system issue. I would prefer just a client credit account that would not prohibit us from entering in any insurance payment when we need to. It has sincerely been a pleasure working with your office! If you can, please email me some times you're available to chat about how you might be able to make the deposit account work better for the practice. Best up-and-coming software for Psychologists and Mental Healthcare Workers!!! Pros: *Excellent customer service with quick response time to your questions and concerns. If they do not have an answer to your question, they research it until they do and follow-up with you quickly. *Great software features such as, but not limited to: Direct links to pre-register your patients from your website, easy-to-use scheduling calendar, inter-office messaging system, ability to upload patient records and insurance cards, ability to keep track of authorizations and pre-certifications, and the ability to charge patient's credit cards directly through TheraSoft with First Data Merchant. *Remote access to your patients' accounts no matter where you are at. *Extremely user-friendly filing of electronic or paper claims submission. Cons: *The accounting reports could be better in regards to end of month reporting (insurance plus patient payments). *Billing statements can be very time consuming if you deal with a lot of divorced parents and have to seperate the bill up between parties. *Sometimes the authorization tracking system is off and inaccurate and it does not alert you when you are low on visits. Overall: We have been using TheraSoft for approximately a year now and have been very pleased with its overall performance. You cannot beat their outstanding customer service and software features for such a great price! I highly recommend trying this company out. Calendar, therapy notes, and assessments are easy to use on both phone and computer. Pros: Notes, calendar, and assessments- easy to use. There is an option to confirm attendance, write note, and submit billing within one screen. Cons: Difficult to set up billing, not easy to resolve issues or track. It is also difficult to submit secondary claims. I understand the issue with transmission of secondary is because of the process of how secondary can be billed, the insurance company however changes the claim number when the first claim goes through so they require a mailed hcfa to the secondary. Also I believe that you have some issues with Medicare that can be resolved with some changes to how your credentialed. We know have a credentialing department that can help you with these changes if you are interested. Please give us a call so we can help you get this resolved. 888-435-8203. I am most appreciative of the continued improvements made to the site. Pros: I like the pre-registration feature, claims management, integrated website, merchant account, documentation features - but mostly I like the support. One tech, Tiffany P. has been particularly helpful! Cons: A list of suggested diagnostic codes based on intake questionnaires and assessments would be nice. There isn't much not to like! We appreciate the feedback and look forward to many more years of working with you! Pros: Ease of use, I find that it is easy to navigate and in general, it has all the functions that I need. I find the software primarily excellent for my practice needs. Cons: I would like to see more variety of reports, specifically assessment and treatment that are not so lengthy. It would be great to have an option to have a pre-registration for families. Overall: The software saves me time in terms of running my practice. I find the system very easy to use, I can access it from anywhere, and I really appreciate support. Pros: Simple, secure, cloud-based, comprehensive practice management software makes my work much easier to do on a daily basis, and allows me to focus on the clinical work. Cons: Half-jokingly, I wish that it could do my paperwork for me! It also cannot demystify the insurance world with all of its ins and outs. Overall: It allows me to focus on my clinical work and makes running the business as easy as possible from the practice management side. Pros: Ease of use between items and logical presentation of topics for a therapy office use. Cons: The List of ICD Codes is not alphabetized. Overall: Streamline the system of managing client information in an organized manner, and ease of billing, either insurance or credit card for payment. Thank you so much for the review, in doing so we grow, with the issue of the ICD10 I will have my team look into this and get this problem resolved. Pros: Easy to use, great support staff, and affordable! Cons: Nothing yet. The tutorials are helpful when I have questions and the office staff is extremely responsive. Overall: We have used Therasoft Online for over 8 years and the company continues to adds benefits for providers and office support. There is flexibility with the notes, scheduling, and session types. Again, amazing company to have as our online office management system. Easy to use but could be a bit more intuitive in design. Customer support is 5 Star all the way. Pros: Everyone I've spoken with have been courteous and knowledgeable. one od the Customer support representative in particular has been very accommodating and scheduling meetings for me to learn and get better at using the software. I really appreciate her professionalism. I declined several other EHR systems (Simple Practice, Therapynotes etc.) because they did not have support staff I could verbally speak with. Overall: Easy to process most of my payments. I've been using Therasoft for my business for seven years now, and I'm very pleased. Pros: I like that it does everything all in one place-- scheduling, billing, documenting... I also like that it is all online so I can access it from anywhere. Cons: Sometimes it runs a bit slow for me when I'm in a hurry. These periods of it running slow don't seem to last long though. Thank you Keri! We've loved working with you throughout the years and look forward to many more! Pros: I like that I can do everything from one screen when I am writing notes, filing insurance, recording payments and recording attendance. Cons: There is so much that I can do on it, that I still haven't learned all of its capabilities. The reports area is confusing to me. I don't know which one does what. Overall: Ease of use, ability to file insurance and record notes quickly. Wonderful product, fabulous staff, and constant improvements - great software! Pros: Ease of scheduling and billing. Cons: Inability to easily schedule overlapping events. 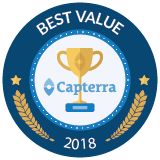 Overall: From the inception of my experience with Therasoft, the responsiveness, concern, and level of support delivered has always been exemplary. A company is always much more than it's product; it must be backed by capable and caring individuals with a eye toward the future. This is what I have found in Therasoft, and is the primary reason for my loyalty. Pros: It is easy to attend the clients and bill claims with a touch of a button. Saves time. Cons: Really nothing. Just sometimes if walk away for a minute, have to sign back in. Overall: Therasoft makes it easy to attend clients, bill claims and keep track of the accounting and billing. Great software for the practice. This software is easy to navigate when needing several pieces of information. Pros: This software is flexible and fits with how I want to use it. The support team is always helpful and patient with me. Cons: The assessment documents are not as complete as I would like. I've encountered some problems in submitting claims. Overall: It meets EMR requirements. It saves me space(less paper). It helps me to be more organized. Pros: I am a solo practitioner who does it all: I screen, do the intake and see my clients. I also do all the billing and send statements when necessary. I like to keep it simple, so I know that I do not use all the features I could in this program. I love how it is web-based, because if I don't get the notes or insurance filing done at the office, I can do it at home. This helps me remain flexible and available for my family's needs. Cons: I wish I had more training on it before I moved my practice and started using it, because I am so busy that I don't always get back to the areas I am having problems with. However, that is more a negative about me and how I need to request more training time than an actual problem with Therasoft online. I do wish that when I am entering in an Attendance of a session and then move to Payment screen that I'd still be in that client's file and not have to re-enter that client in the Payments page (and again in the Progress Notes page). You really have to pay attention or you might pay on the wrong person. Overall: I have looked at several systems, but nothing as comprehensive as this for mental health professionals. Throw in the available HIPAA guide and you really have all that you need for practice management. I am currently talking with other mental health professionals about using it. Overall: I have been using therasoft online for about 6 years now. The customer service is excellent and the quality of the program meets all of my professional needs. I can set appointments, clients payments, keep clients progress notes, intake forms, assessment. Everything I need to be in compliance and keep records secure.